beyond the classroom: visits, residentials, competitions, summer schools, masterclasses, links with universities, businesses and other organizations. 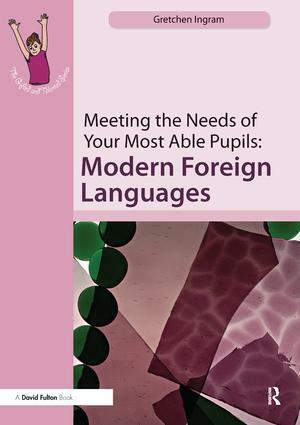 Including access to online materials this book is essential reading for secondary teachers, subject heads of departments, Gifted and Talented co ordinators, SENCos and LA advisers. Foreword; Introduction; The National Picture; Departmental Policy and Approach; Recognising High Ability or Potential; Classroom Provision; Supporting the Learning of More Able Pupils; Beyond the Classroom; Appendices; References. Gretchen Ingram is a former Head of Department with wide experience of teaching, learning and examining Modern Foreign Languages in various UK comprehensive schools.